The Best Shark Dive in the World! : Bon Appetit? Commercial Shark Diving is quickly morphing into a global industry and as always in such cases, the transition doesn't come easy. Whereas the anti-Shark-diving lobby, scientific and not, continues to successfully pester us with their allegations, we just seem to be unable to get our act together, circle the wagons and mount a credible common defense. Granted, selling Sharks to the public at large will always be a challenge. The opposition's arguments feed on our primeval fears and convey the illusion of intuitive plausibility. Very hard to refute as in order to do so, we would need hard and unequivocal scientific data. And those are so far lacking. Having said this, I know of at least two papers, one from South Africa and one from Australia, that postulate that what we do has no discernible behavioral consequences. Actually, make it three, as Juerg's recent research on Shark Reef may well come to the same conclusions. I'm thus highly confident that in the end, people will come to realize that our large predatory Sharks are just as fascinating and worth protecting as any other alpha predator. It has taken decades of dedicated research and marketing to dispel the myth that wolves, grizzly bears, lions and tigers are nothing more than man-hunting vermin that needs to be eradicated, so I guess we must be patient and persevere. Let's just hope that by then, it won't be too late. The real challenge right now however seems to be our incapacity to work together. Keep in mind that until quite recently, diving was considered a dangerous sport reserved for the passionate few. The Shark Diving pioneers were regarded as, and probably were, a special breed of entirely self-taught, adventuresome, thrill-seeking and death-defying macho warriors and equally intrepid amazons and were consequently accorded Hero status. Talk about an eclectic collection of unique and charismatic individuals with strong opinions and huge egos! 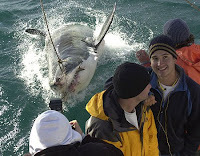 But now, Shark Diving has gone mainstream and is firmly nested within the entertainment industry. 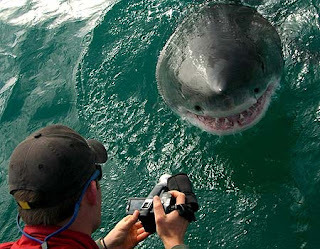 As in: I shall pay for a trip to Guadalupe Island and I shall see Great White Shar ks - or else! In the process, the original Heroes are gradually being replaced by media-savvy, nimble and business-minded service providers. Personality cult is being replaced by client service. Adventure and discovery, by interactive and notabene, guaranteed ecological encounters. Roughing it out on the High Seas, by aircon, en suite bathrooms and warm towels. Individuality, by the need for a uniform global product. And alas, sometimes, excitement by bored indifference. On top of the historical and ever-present personal animosity between the original silverbacks, this has created substantial resentment against what is perceived as a territorial invasion by parasitic upstarts. Having been at the receiving end, but also, having had to dish out my fair share of aggro myself, I know what I'm talking about. Thus, to finally make my point, getting everybody to sit at the same table, to share our passion, experiences, visions and research in order to devise a common approach supported by unified procedures remains a gargantuan challenge. Once again, we will have to be patient and persevere. Plus, there is the cultural gap - we may all be one species but sometimes, one has to wonder. I didn't quite think about that particular aspect until presented with the shocking document below. It depicts my European friends Juerg and charming Marlen desperately trying to wean Gary Adkison, one of our Heroes, off his addiction to Kraft cheese spread and other all-American junk delicacies. To witness, Juerg is displaying a beautifully ripened original Brie de Meaux and Marlen has obviously contributed a lovingly arranged and simply delicious Assiette de Fromages. As to Gary - well, what can I say. Anyway, a belated Bon Appetit - or whatever. This is one of the best overall looks into our industry that I have seen written for a long time. Truthful, upfront, and unflinching at it's expose into one of the main problems we have to "overcome" if we're to counter the organized anti-shark diving lobby. We, as an industry, often suffer from an appalling lack of "cohesion". For reasons based on hubris, ego, and flat out ignorance. This would be a sad way to lose any industry and make no bones about it, the entire industry is under assault. It's like watching a slow moving lava bed. One morning your house is two miles away from the wall, the next it's on top of you. It is ours to win or lose. Information sharing, thoughts, and political will are what will win this one for the future. Thank you very much and of course, I agree. Having said this, I personally don't mind the controversy - it's just anther way of sharing opinions and it for sure puts the issues on the table. Let's just try and keep the public out of it - and yes, the vitriol too. I'm also acutely aware that I stand on the shoulders of some truly great people. We should never forget to recognize and admire the courage, vision and outright chutzpah of those early pioneers. And empathize with their frustration at witnessing the banalization and commercialization of what used to be the absolute crowning of one's diving career. - encourage and sponsor scientists to join us in order to collect the necessary data. 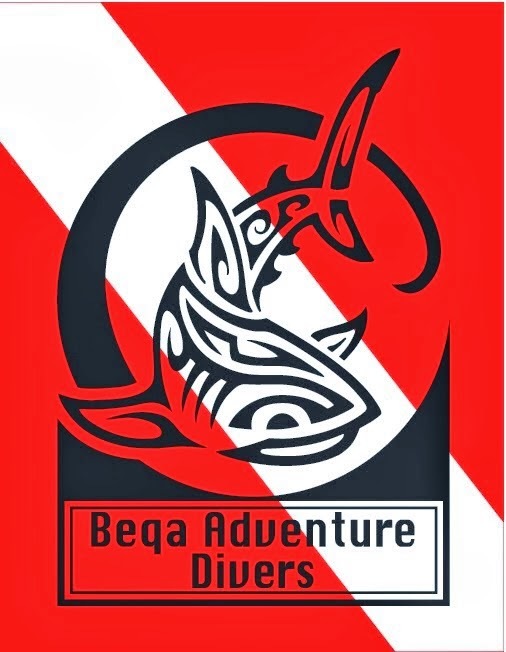 After all, our dives offer the best opportunities for predictable encounters in a largely controlled environment. This is however costly as it implies reserving space, and time, which we could otherwise sell. And we may well end up with answers we don't like. But it must be done. - and finally, each of us will have to make a judgment call about how far we are willing to push the envelope in response to competition and to our clients' demands for ever more adrenaline and spectacular images. Procedures are subjective and situation-specific and finding the best balance will always be a challenge, see http://fijisharkdiving.blogspot.com/2008/02/diving-with-sharks.html I'm sure you know what I'm talking about. Very very difficult indeed. Anyway, looking forward to seeing you at DEMA. Mike you're pretty much a "Shark Prophet" as far as we're concerned. Where have you been for the past 5 years? Keep going with that brilliant line of thought-it's what will drag our industry into the future, screaming and kicking all the way no doubt. We have been big proponents of everything you're saying since day one.